The Polish II Corps rendered valuable service to the allied cause during the arduous Italian campaign. Despite the Nazi conquest of European nations during World War II, individual soldiers from the occupied countries rose again to fight the German Army, and the largest army in exile to fight the Germans was Polish. Polish forces fought in North Africa, on the Eastern Front, in Western Europe, and on the Italian peninsula. Following the Soviet occupation of eastern Poland in 1939, some 1.5 million Polish citizens found themselves arrested and transported to Soviet labor camps and prisons. After the Nazis struck Russia, British diplomats led by Foreign Secretary Anthony Eden indicated to the Soviets that the exiles could provide a potent source of manpower for the antifascist struggle. On July 30, 1941, the leader of the Polish government in exile, General Wladyslaw Sikorski, reached an agreement with the Soviets. Poles residing on Russian soil after September 1939 were allowed to join the Polish armed forces, responsible only to the Polish government and led by Polish officers. Major General Wladislaw Anders was given command of the proposed army. Born in a Russian-controlled area of Poland, he graduated from high school in Warsaw and continued on to Riga Technical University. In 1913, he joined the Russian Army and entered the cavalry school. During World War I, he commanded a cavalry unit and was wounded five times. In 1917, he studied at the Academy of the General Staff in St. Petersburg. Then he took part in the formation of the Polish Corps, under General Jozef Dowbor-Musnicki. After the surrender of Germany, he returned to Poland in 1918 and joined the Polish Army and became chief of staff of Greater Poland. During the Russo-Polish War in 1920, he directed the Poznań Uhlans. He entered the Ecole Superieure de Guerre in Paris and became the military commander of Warsaw in 1925. In 1932, he led the Polish team riding in the equestrian competition of the Nations Cup in Nice. Between 1928 and 1939, Anders commanded the cavalry brigades based in eastern Poland. He fought against the Wehrmacht in September 1939. After fighting along East Prussia, his cavalry task group marched south toward Hungary and engaged the Red Army invading Poland on September 17. Wounded, the Soviets captured him, and the NKVD (Soviet Secret Police) imprisoned him in Lubyanka Prison and later in Lwów. The communist government refused to allow the Polish soldiers to head to Britain to join the units forming there. Soviet Premier Josef Stalin would only open the gulag gates to provide soldiers for his own army. The Soviets noticed two clear attitudes among the Poles: disdain for everything communist and complete trust between the soldiers and officers. By November 1941, there were 40,000 Polish men at arms, 60 percent without boots, numerous Polish women, and hundreds of children to be cared for. The Soviets reduced the food rations. Most of the welfare aid for the gathering Polish citizens came from over 800 American charitable services, which enabled the Poles to set up 105 schools and 58 old people’s homes in Russia. By March 1942, the army’s strength reached 67,500 soldiers. By April 1942, approximately 26,000 Polish veterans were organized into two divisions in Uzbekistan under the command of Anders, but the communists provided only 8,651 rifles and 16 artillery pieces. After long political wrangling and a direct appeal from British Prime Minister Winston Churchill in a letter dated July 17, 1942, Stalin finally agreed to allow the Poles to move to Iran as part of the Allied occupation force there. Anders led an exodus of 112,000 men, women, and children. Unfortunately, over 4,000 soldiers died in Russia waiting for Stalin’s permission. From Iran, the Poles moved to Iraq and came under British command for further training and equipping. By August 1942, an additional 44,000 soldiers and 26,000 civilians, refugees and exiles from around the world, joined them. Although the majority of these were ethnic Poles, there were also members of other nationalities who joined the units of II Corps, most notably Jews, Belarusians, and Ukrainians. As one of their comrades attempts to establish communications via walkie-talkie, a pair of Polish soldiers mans a two-inch mortar on an Italian hillside. 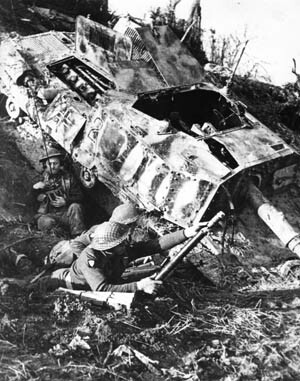 The Poles have taken cover adjacent to a destroyed German self-propelled gun. After Polish Prime Minister Sikorski died in a plane crash at Gibraltar, Anders became the focus of Polish nationalistic pride and fervor. To his countrymen Anders was an inspiration, and to his allies he was a military leader whose ability commanded the greatest respect. Anders met Churchill at the British Embassy in Cairo on August 22. Churchill immediately liked Anders, while Anders extended trust and belief in the prime minister. The Polish II Corps became a major military formation of the Polish Army in World War II under the nominal control of the Polish government in exile in London. Its 3rd Carpathian Division was formed in the Middle East from Colonel Stanislaw Kopanski’s seasoned Carpathian Brigade, which fought at Tobruk and in Egypt. The 5th Kresowa was built around the staff of the 5th Division originally organized in the Soviet Union. Manpower shortage meant that each Polish division would have only two brigades instead of the standard three in a British division, with skeleton staffs for their third brigades awaiting the recruiting of additional manpower. An armored brigade was formed with only 10 tanks, along with an independent infantry brigade that became the basis for a third division. To help solve the troop shortage, the Poles recruited Polish prisoners who had been forcibly recruited into the Wehrmacht. In July and August 1943, the Polish II Corps moved to Palestine for final training. This consisted of maneuvers in the mountainous regions to acclimatize the troops to the terrain they would encounter in Italy. Prior to arriving in Italy, the Corps totaled 45,000 men. The 3rd Division included the 1st and 2nd Carpathian Rifle Brigades, and the 5th Division was composed of the 5th Wilenska and the 6th Lwowska Infantry Brigades. The Corps’ divisional order of battle followed British lines with three field artillery regiments, an antitank regiment, engineers, a heavy machine-gun battalion, communications troops, an antiaircraft artillery regiment, and a reconnaissance regiment, the 12th Podolski Lancers in the 3rd Division and the 15th Poznanski Lancers in the 5th Division. The Corps’ 2nd Armored Brigade consisted of three armored regiments and supporting units. The 3rd Division had 13,200 men, the 5th Division 12,900, and the 2nd Armored Brigade 3,400. In 1944, the corps was transferred from Egypt to Italy and became part of the British Eighth Army under General Oliver Leese. There was concern as to how the corps would be utilized. The British wanted to augment their replacement pool with the Poles. Anders furiously rejected suggestions that his corps be broken up and attached to British and American divisions in battalion-sized units, but attempts to make up the corps’ manpower shortage with recruits from Polish communities in Canada and the United States failed miserably. The Soviets also refused to allow more Poles to leave the country. After months in the Soviet Union, the soldiers who formed the Polish II Corps were allowed to leave the country for their eventual destination of Iraq, where they came under British command. Their families were permitted to follow the soldiers to the West. Anders proposed to send his corps into battle without a pool of replacements. The Poles would take “liberated” manpower to replace their losses and flesh out their incomplete divisions on the battlefield. Large numbers of ethnic Poles had been impressed into the Wehrmacht as ethnic Germans, and Anders believed they would gladly join him if given the chance. The Poles also had intelligence indicating that thousands of Polish prisoners had been sent to Italy as laborers. These men could also be freed and join the II Corps. The British relented, and the Polish II Corps would fight as an autonomous unit. After arriving in Italy, the Polish corps eventually swelled to a force of 110,000. At age 52, Anders commanded Poland’s only force facing the Germans in Western Europe. Elements of the 3rd Carpathian Rifle Division began landing in Italy at Taranto on December 21, 1943. The transfer of all Polish units from Egypt and the Middle East continued until the middle of April 1944. These troops landed at the Italian ports of Taranto, Bari, and Naples. Corps headquarters followed in January 1944, the 5th Kresowa Division in February, and the armored brigade in April. The 2nd Base Corps completed the move. The first Polish unit to see action in Italy was the Independent Commando Company. On December 29, 1943, it took part in a diversionary raid with British No. 9 Commando on the Gariglianio River estuary defenses. The 3rd Carpathian Division entered combat along a quiet sector of the front on the Sangro River. On February 10, Lt. Gen. Anders reported to General Leese at Eighth Army headquarters at Vasto, and the Polish II Corps officially became part of Eighth Army. The 3rd Carpathian Division’s first patrol went out on February 21, northwest of San Angelo. In May it moved up to Monte Cassino, where the Poles proved their worth in capturing the destroyed abbey high atop a mountain that commanded the Allied approaches through the valley below. The German defenses at Cassino had not been penetrated despite three assaults and heavy bombing. The enemy held fast and continued to block the road to Rome. In May, along the 18-mile stretch from Cassino to the Gulf of Gaeta, 17 Allied divisions stood ready for the next phase of battle. After previous attempts had failed to take Cassino, General Leese called Anders and his chief of staff, General K. Wisniowski, to Eighth Army headquarters on March 24. Leese told Anders of the planned offensive, Operation Diadem, to open the road to Rome. The Polish II Corps prepared to launch the fourth assault on the monastery. Operation Diadem would begin May 13 and the Polish II Corps’ task was to isolate the abbey from the north and northwest, dominate Highway 6, and then capture the abbey itself. At the same time, eight American divisions, four Commonwealth divisions, and four French divisions were to cross the Liri River, cutting Highway 6. The Polish II Corps assault force consisted of the 3rd Carpathian Rifle Division, the 5th Kresowa Infantry Division, and the 2nd Armored Brigade. 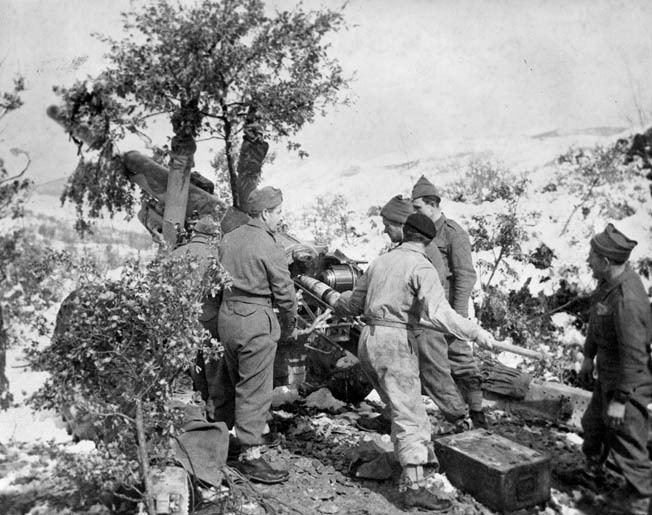 Soldiers of the Polish II Corps attached to one of the Carpathian Rifle Brigades fire a British 4.5-inch field artillery piece during offensive operations in the Apennine Mountains of Italy. The corps staff began to formulate the battle plan. General Anders contributed extensively to the staff’s work. He drew certain conclusions from the previous Allied assaults and decided not to become bogged down in a street fight in the town. He rejected an assault from the south that was too exposed to German flanking fire. He decided to attack from the northwest between Hills 569 and 601. The 3rd Carpathian Division was responsible for seizing the southern end of Snakeshead Ridge, Massa Albaneta, Monte Castellone, and Hills 593 and 569. The 5th Kresowa Division had Colle Sant’ Angelo and Hills 575, 505, 452, and 447, and was then to cover the advance of the 3rd. Each division allotted one brigade for the initial attack. The plan utilized direct frontal assault into strong German positions. Capture of the high ground would isolate the abbey. To the Polish soldiers, who had wandered through Russia, the Middle East, and now Italy for five years since the defeat and subjugation of their country and people, the battle would be a chance to confront the hated Germans and regain their honor. For the night assault, the Polish troops blackened their faces and equipment and donned camouflage wraps. A 40-minute barrage opened the assault. Immediately, the Poles caught an unlucky break. The Germans planned to relieve defenders with fresh units, and they had nine battalions in the strongpoints when the assault started. At 1 am, the 3rd Carpathian Rifle Division’s 1st Carpathian Rifle Brigade assaulted Point 593 (Mount Calvary on Snakeshead Ridge), Hill 569, and Albaneta Farm. The 1st Carpathian Battalion’s attack on Massa Albaneta failed with heavy losses, due mainly to German artillery. By 2:30 am, the assault battalions had lost one of every five men. The 2nd Carpathian Battalion of the 1st Carpathian Brigade carried Point 593. Four counterattacks by German paratroopers, the final ending with bitter hand-to-hand fighting, left few Poles on the position at dawn. Forced to retreat, the entire 2nd Battalion numbered no more than a few dozen men. The 3rd Carpathian Battalion strike on Hill 569 also failed. The 5th Kresowa Infantry Division’s 5th Wilenska Brigade jumped off a half hour after the Carpathian Brigade to seize Colle Sant’ Angelo, Hills 706, 601, and 575. The infantry ran into heavy fire. By 3 am, all three battalions were engaged along Phantom Ridge. The division commander, Brig. Gen. Nikodem Sulik, committed the 18 battalions of the 6th Lwowska Brigade to reignite the advance, but it was not possible to continue the attack. The 13th and 15th Battalions of the 5th Wilenska Brigade were decimated. According to the brigade diary, “In the valley and on the slope of the ridge lay corpses, twisted human shapes, shattered limbs, bloody bits of bodies.” General Anders had no alternative but to terminate the assault. The Poles had attacked with panache and skill but took heavy casualties. The Germans committed a horrific atrocity after the assault. Two young officer cadets were captured, and the Germans crucified them with barbed wire and nails. No quarter was given by either side from that moment on. With victory in sight but heavy combat still ahead, Polish II Corps soldiers slog through mud somewhere in Italy in February 1945. The Poles acquitted themselves admirably throughout the Italian campaign. The II Corps staff immediately began drawing plans for a second assault. Leese arrived and expressed satisfaction with the Poles’ attack because it was “of great assistance” drawing artillery fire and reserves away from the British. Anders used the same basic strategy, but this time the attack would be made by both entire divisions. Both brigades of the 5th Kersowa Division were directed on Colle Sant’ Angelo. The 3rd Carpathian Division focused both brigades on just Albaneta. The Poles concentrated their artillery support and planned a rolling barrage for the advancing infantry. Polish sappers and engineers cleared minefields and obstacles during the interim. Leese endorsed the entire endeavor. The second assault jumped off at 10:30 pm on May 16. New brigades were leading the assaults, supported by 200 air sorties at daybreak. One observer wrote, “When the second attack began the soldiers were drained physically and psychologically. The issue hung on a knife edge, only vigorous leadership could overcome the exhaustion and inertia.” Fighting raged all night. Lance Corporal Dobrowski of the 5th Battalion described the assault on Hill 593: “We begin to ascend Hill 593, the weakest soldiers can no longer keep pace. We are in no particular formation. No sections; no platoons. The situation is such we must use our own initiative. Now we engage the enemy. All is confusion and the Germans’ positions are mixed with ours. With munificent impartiality we hurl our hand grenades. From the neighboring heights Spandaus, Schmeissers and heavy machine guns catch us in a murderous crossfire.” The hill was taken and held. The divisions seized the initial objectives on Phantom Ridge and Snakeshead Ridge then moved on to Hills 601, 575, 505, and 569. By May 18, the Poles had seized the objectives. The French Expeditionary Corps breakthrough south of Cassino forced the German Tenth Army to order the withdrawal of the 1st Parachute Division from Monte Cassino. The Poles intercepted the radio message but were too weary to pursue the paratroopers. Corps headquarters sent word to the 3rd Carpathian Division to send a patrol from the 12th Podolski Lancers Reconnaissance Regiment to scout the abbey. The scouting party, led by Lieutenant Casimir Gurbiel, entered the ruins of the abbey and found them empty except for a few wounded German paratroopers. A homemade regimental pennant was raised at 9:50 am above the ruins. A Lancer bugler played the medieval Polish military signal, the “Krakow Hejnal.” When the notes were heard in the 4th Carpathian Battalion’s command post, officers and enlisted men unashamedly cried. 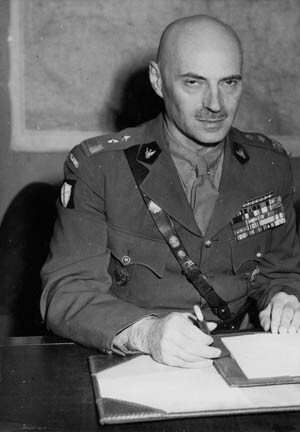 Major General Wladislaw Anders commanded the Polish II Corps from training through arduous combat during the Italian campaign and became a national hero in his native land. The Poles continued fighting until May 25, by which time the positions of Saint Angelo Hill, Point 575, Passo Corno, and Mount Cairo were captured. The Polish II Corps lost 50 men a day, about 20 percent of its strength, by the end of the Cassino battle. The Poles immediately attacked east to penetrate the Hitler Line before the Germans could man it. The Polish II Corps received an honorary decoration after Cassino. Eighth Army Order No. 65 granted the right of all individuals who took part in the Cassino operation to permanently wear the Eighth Army shield on their right shoulder even if in the future they were no longer part of the Eighth. Later, Order No. 95 extended the privilege to any soldier of the Polish II Corps. After the battle at Cassino, the Polish II Corps shifted to the Adriatic coast. On June 15, 1944, the 3rd Carpathian Rifle Division replaced the 4th Indian Division. The entire sector came under Anders’ command. The Polish corps headquarters was located at San Vito near Ortona. Additional British regiments and Italian units bolstered the strength of the corps. The 17th and 26th Heavy Artillery Regiments, Royal Artillery, the 7th Queens Own Hussars, and the Italian Corpo Italiano de Liberazione came under the Polish II Corps. The 5th Kresowa Infantry Division arrived between June 18 and 21, followed by the corps artillery and the 2nd Armored Brigade. Anders also deceived the Germans. He created the impression that the 3rd Carpathian Division would attack along the coast road. Instead, he launched the 5th Kresowa and the 7th Hussars on an encircling sweep inland. Anders performed a series of feints, radio deception, and skilled maneuver, unhinging the German 278th Division. Supported for the first time entirely by air attacks by the Polish City of Gdansk No. 318 Squadron, the Poles moved rapidly up the Adriatic coast and crossed the Aso River by June 20. Assisted by Italian Alpini, the Poles captured Fermo and Pedaso on June 21. By the 25th, the Polish II Corps faced the German LI Mountain Corps, and stiff resistance held up the Polish offensive around the Chienti River. In July, the Polish corps began rolling again, capturing Numano on July 5 and Osini, only 10 miles south of Ancona, the following day. The Poles repulsed a counterattack by the mountain troops on July 8, and took Monte Palesco two days later. After a fierce battle, Ancona was captured by the Carpathian Lancers on July 18. The 3rd Carpathian Division secured the port and 2,500 prisoners. This was the only battle in the West that was exclusively carried out by the Polish military. The offensive cost the Poles 2,150 casualties. On July 19, the Poles crossed the Esino River and encountered strong German opposition near Ostra. On the 22nd, they reached the Misa River. The Germans placed the 71st Infantry Division and the Poles’ old adversary, the 1st Parachute Division, along the river. It was another 10 days before the Polish force reached the next river, the Misa. A five-day struggle ended with the capture of Ostra, and the corps advanced to the town of Senigallia. On August 11, the Cesano River was crossed, and the Poles seized a series of towns, Gabrielle, Mondolfo, Poggio, and Orciano. Ten days later, the Poles crossed the Metauro River and reached the Gothic Line. The Allies now reorganized their forces before the assault on the Gothic Line. The Polish II Corps was on the extreme right flank at the Adriatic coast with the 1st Canadian Corps on its left. Operation Olive, the breakthrough in the Adriatic sector, began on the night of August 25. The Polish II Corps opened the offensive, capturing the high ground north of the resort of Pesaro. The corps’ fighting lines stretched seven miles inland from the coast with its two divisions advancing abreast. 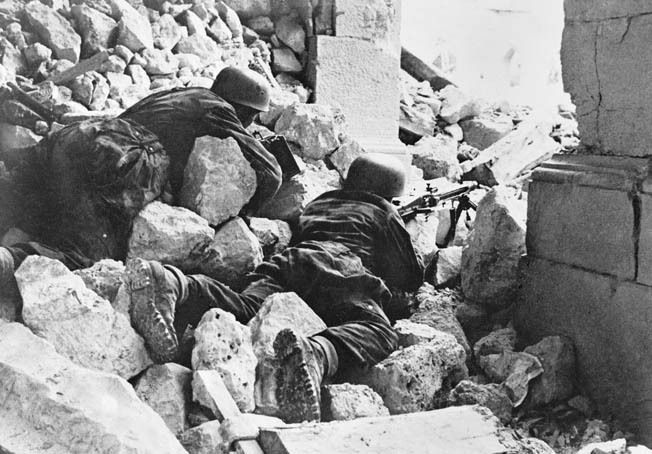 German paratroopers man a machine-gun position amid the ruins of the abbey of Monte Cassino. The night attack by the Polish II Corps, Canadian I Corps, and the British V Corps caught the Germans flat footed and pierced the eastern flank of the Gothic Line. Between October 1944 and January 1945, the Polish II Corps was reinforced and reorganized. The 3rd Carpathian Rifle Division and the 5th Kresowa Infantry Division had the 3rd Carpathian Rifle Brigade and the 4th Wolynska Rifle Brigade added, respectively. The 2nd Armored Brigade was expanded into an armored division with the addition of the Carpathian Lancer Regiment, 2nd Motorized Commando Battalion, 16th Pomorska Infantry Brigade, 4th Armored Regiment Skorpion, 1st Krechowieckich Lancer Regiment, and the 6th Armoured Regiment Dzieci Lwowskich. After a short period of rest, the Polish II Corps returned to the battlefield and occupied Predappio, the birthplace of Benito Mussolini, and Castrocaro on October 27. The Poles bypassed Faenza and crossed the Lamone River on their way to the Senio River. As the rain, mud, and snow arrived in November, the Polish II Corps pushed through the Appennine foothills south of Highway 9. The Polish troops captured Monte Caselo and Lamone in November and Brisighella on December 6. All operations in the region ceased by the end of December 1944. In January 1945, the Italian front was at a standstill. The Eighth Army, after a series of hard-fought river crossings, stood on the banks of the Senio River. The country was sodden from winter rains, and armored operations were impossible. Although most of the men decided to settle in Britain, the Poles did not show the aggressive spirit in the remaining combat. 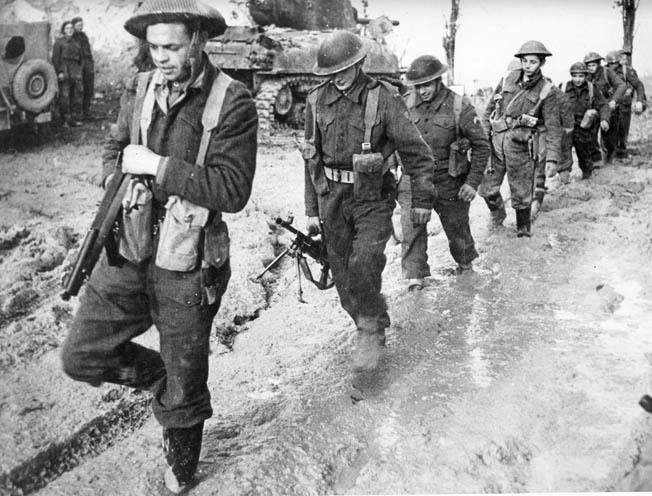 The final offensive to break the stalemate on the Italian front was scheduled for the night of April 9, 1945. The Eighth Army objective was to break through the Po Valley and seize the cities of Bologna and Florence. The Polish II Corps was assigned the direct assault across the Senio River straight to Bologna. The 3rd Carpathian Rifle Division spearheaded the attack across the Senio, north of the Via Emilia (Highway 9) toward Bologna. The corps struck the boundary between the German 98th and 26th Panzer Divisions. The Poles closed in on Imola, 15 miles from Bologna, and by April 14 that town was captured. At this point the Poles were confronted by their old enemy, the German 1st Parachute Division. The Polish attack was so successful that the German division disintegrated. The liberation of Bologna ended 14 months of Polish II Corps operations during the Italian campaign. Today, 1,432 soldiers of the II Corps rest in the Polish War Cemetery in Bologna-San Lazzaro di Savena, the largest of four located in Italy. In May 1945, the corps consisted of 55,780 men and approximately 1,500 women in auxiliary services. There was also one bear, named Wojtek. The majority of the forces were composed of former citizens of eastern Poland. During 1944-1945, the Polish II Corps fought with distinction in the Italian campaign, losing 11,379 men. Among them were 2,301 killed in action, 8,543 wounded, and 535 missing. 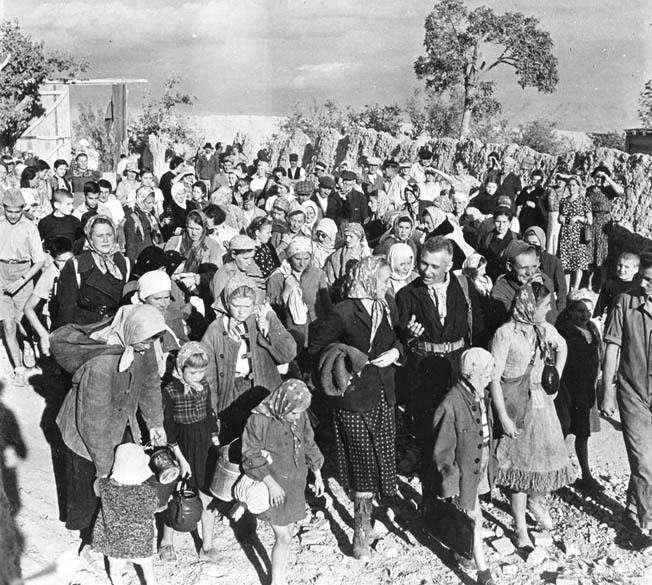 After the war, Polish divisions remained in Italy near Ancona, providing care for displaced Polish refugees. They continued to train because they expected a war between the Western powers and the Soviet Union. The total establishment of the Polish II Corps in mid-1946 was down to 103,000 personnel. In August 1946, two divisions were transported to Britain and demobilized. The 3rd Carpathian Rifle Division remained in Italy as part of the occupation forces. Because of the Soviet occupation of Poland, most of the Cassino veterans never returned to their homeland. Inexplicably, the Poles were not allowed to participate in the massive victory parade in London. Ten members of Parliament signed a letter published in the Daily Telegram in June 1946, objecting to the treatment of the Poles. The letter read, “Polish dead lay in hundreds on Monte Cassino. The Poles fought at Tobruk, Falaise, and Arnhem. Polish pilots shot down 772 German planes. The Polish Forces who fought under British command have not been invited to the Victory March June 8. Ethiopians will be there, Mexicans will be there, the Fiji Medical Corps, the Labuan Police and the Seychelles Pioneer Corps will be there—and rightly too. But the Poles will not be there. In 1947, the Carpathian division was moved to Britain and housed at Hodgemoor Camp, Chalfont St Giles, and Buckinghamshire. It maintained a presence there until 1962. 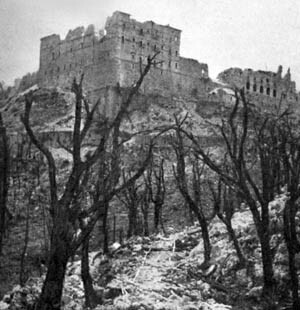 Although German authorities asserted that their troops had not occupied the Benedictine abbey of Monte Cassino, Allied commanders wanted it bombed. After the aerial bombardment that left the abbey in ruins, German paratroopers did occupy the rubble and put up stiff resistance against Allied troops. Anders, a staunch anticommunist, remained in Britain. The Polish communist government stripped him of his Polish citizenship. He died in exile in 1970. His citizenship was reinstated posthumously in 1989, with the formation of a democratic government in Poland under Lech Walesa. Anders also received the title of Commander of the Legion of Honor from the new government. In accordance with his will, he was buried among his soldiers in the Polish military cemetery at Monte Cassino. Tags Allied Commanders, Allies, Anthony Eden, Apennine Mountains, Axis, Battle of Ancona, Benito Mussolini, Bernard Montgomery, British Eighth Army, Cairo, Charles de Gaulle, General Sir Alan Brooke, Gothic Line, Harold Alexander, Italian Campaign, Joseph Stalin, Katyn Forest Massacre, Mediterranean, Monte Cassino, Naples, Nazi Germany, north africa, Oliver Leese, Operation Diadem, Poland, Polish II Corps, Quebec Conference, Red Army, Richard McCreery, Rome, Royal Air Force, Russia, Russo-Polish War, Soviet Union, Warsaw, wehrmacht, Winston Churchill, Wladislaw Anders, Yalta Conference.